Welcome to AAPK. 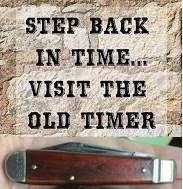 The bad news - your knife is not very old, may be even in current production. Frost Cutlery is primarily known for low end knives, made in China or Japan. Yours and most others are worth maybe $5 or $10. No collector value. The good news is it would make a good user. Put it in your pocket! And welcome...... take your shoes off and stay a while.